Adelges nordmannianae induces terminal (=branch-end) galls (see first picture below) on its primary host, oriental spruce (Picea orientalis). The galls are 2-15 mm long, globular, pinkish, strawberry-like when young, but later becoming greenish with red or purple coloration at the bases and tips of scales. The gallicola of Adelges nordmannianae which develops in the gall (not shown here) has the body and wings at first greenish, darkening in a few days. The antennae have large rhinaria on segments IV and V which extend half the length of the segment, or even more in the case of segment IV. Segment V is much narrower than the other segments and distinctly cigar-shaped. The rhinarium on III is almost half the length of the segment and extends more than half way round it. Adult body length is 1.1-1.54 mm, body width is 0.55-0.66 mm. The secondary host of Adelges nordmannianae is fir (Abies). 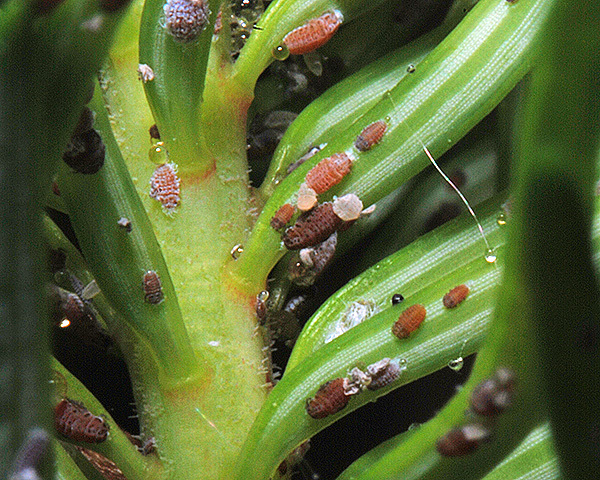 Nymphs overwinter on fir and, on maturing, deposit clusters of brownish-orange eggs. These hatch at bud-burst and the reddish brown 'crawler' disperse over the young needles (see second picture below). The first instar larva of the sistens morph (the overwintering neosistens stage) is the stage often used for identifying Adelges nordmannianae. The wax pore plates on the inner margins of meso- and metathoracic spinal sclerites contain numerous small rounded pits, arranged in 2-4 areas, the most central area containing 7-12 pits. The total number of pits in the central areas of the spinal wax pore plates of the meso- and metathorax together with abdominal tergites I-III (i.e. 10 central areas) is 57-104 (cf. Adelges piceae, which has 18-63 pits in the 10 central areas). There are then several parthenogenetic generations of multiplication, with both apterae and alatae produced. The third picture above shows mainly immature Adelges nordmannianae alatae (which are unwaxed) and a few apterae (waxed). Where the primary host is present (the Caucasus mountains of Russia & Turkey), Adelges nordmannianae has a two year life cycle, host alternating between its primary host, oriental spruce (Picea orientalis), and its secondary host, Nordmann fir (Abies nordmanniana). On its primary host it produces small rounded terminal galls. The winged forms that emerge from the galls migrate to fir where it has a series of parthenogenetic generations. This adelgid has been introduced to much of Europe, North America and New Zealand where it is anholocyclic on a variety of secondary hosts, including Nordmann fir and silver fir (Abies alba). 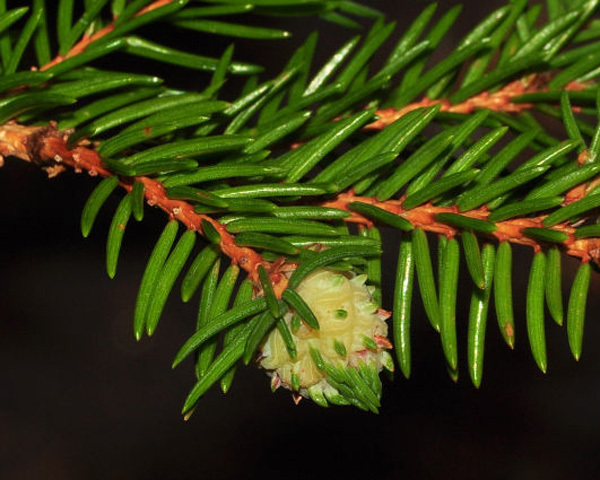 Adelges nordmannianae has been recorded from 4 Picea species (Picea abies, Picea glauca, Picea omorika, Picea orientalis). Of the 14 aphid species Blackman & Eastop list as feeding on Oriental spruce (Picea orientalis) Baker (2015) lists 12 as occurring in Britain: Adelges abietis, Adelges laricis, Adelges nordmannianae, Adelges viridis, Cinara costata, Cinara piceae, Cinara pilicornis, Cinara pruinosa, Elatobium abietinum, Pachypappa tremulae, Pineus cembrae and Pineus orientalis. Adelges nordmannianae has been recorded from 11 Abies species. Blackman & Eastop list 10 species of aphid as feeding on Nordmann fir (Abies nordmanniana) worldwide, and provide formal identification keys. Of those aphid species, Baker (2015) lists 7 as occurring in Britain: Adelges nordmannianae, Adelges piceae, Cinara confinis, Cinara costata, Cinara pectinatae, Mindarus abietinus and Prociphilus fraxini. Blackman & Eastop list 15 species of aphid as feeding on silver fir (Abies alba) worldwide, and provide formal identification keys. 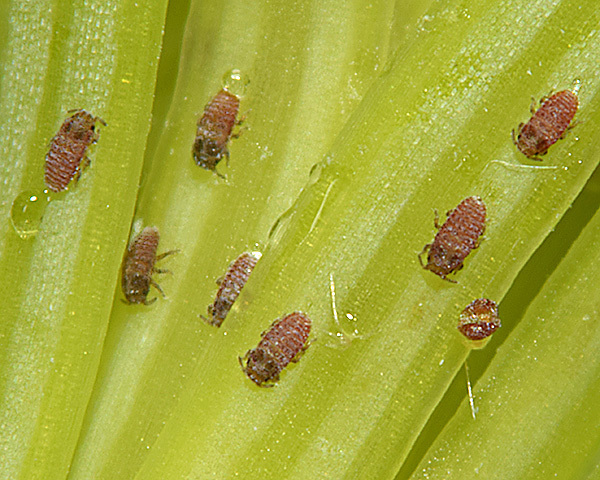 Of those aphid species, Baker (2015) lists 8 as occurring in Britain: Adelges nordmannianae, Adelges piceae, Cinara confinis, Cinara costata, Cinara pectinatae, Mindarus abietinus, Prociphilus bumeliae and Prociphilus fraxini. Nordmann fir is the main species used for Christmas tree production in many Northern European countries. Adelgid attack has caused important losses of trees in plantations. Mass attacks are rare and only occur outside the natural distribution area of the particular fir species. Within the Caucasus mountains populations are kept low by natural enemies.